Motorbike racers are a different breed to car racers - they have to be, given the frequency and potential severity of crashes. Sometimes, riders will even try and stay on the bike to save a crash that’s already happening - and that appears to be what Nagashima is trying here. 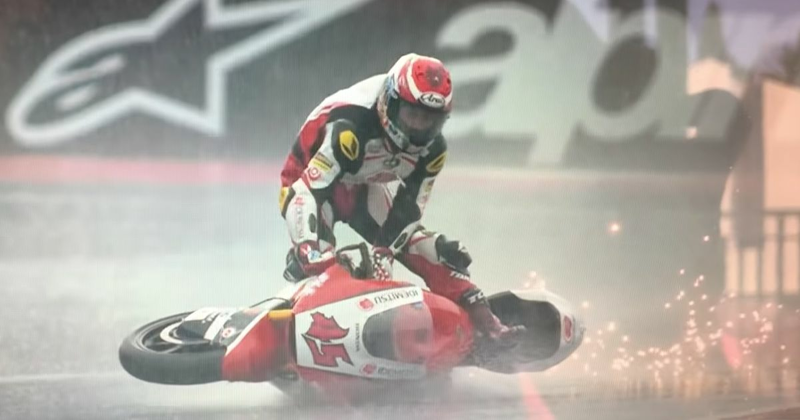 After losing control during a practice session at the Red Bull Ring in Austria, he sits on top of his bike and surfs it (almost literally, given the conditions) down the track. That’s impressive enough, but the other hero here is the person behind the camera, who gloriously captured the whole thing in incredible slow motion. It’s one of the most beautiful bits of camera work you’ll see in motorsport. If you’re in the UK here’s an expanded, slightly higher quality video for you to enjoy.